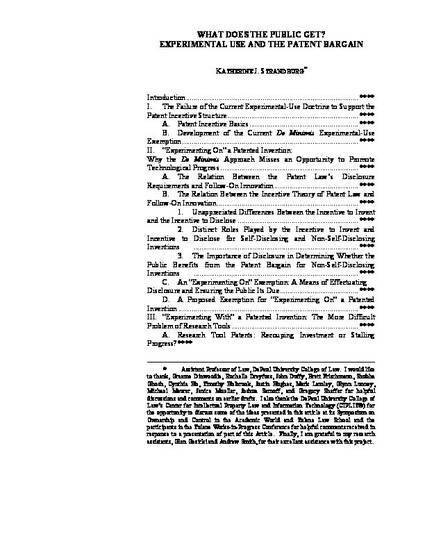 This article deals with the increasing tension between the tradition of protecting commercially valuable inventions through patenting and the need for a robust public domain of freely available technical information as a springboard for further research. The “experimental use exemption,” permitting some unauthorized research uses of patented inventions, might be used to relieve some of this tension. However, the scope of the research exemption has been shrunk so far by recent Federal Circuit opinions that even basic university research is not excused from infringement liability. This article returns to the first principles of patent law -- the incentives to invent and to disclose – and argues that the current narrow exemption is not giving the public the benefit of its patent bargain. In this article, I analyze the effects of disclosure and the incentive to invent on different types of inventions. The article concludes that, partly because of distinctions between types of inventions that I dub “self-disclosing” and “non-self-disclosing,” it is possible to design an experimental use exception that “promotes the progress of the useful arts” more effectively than the current restrictive doctrine.